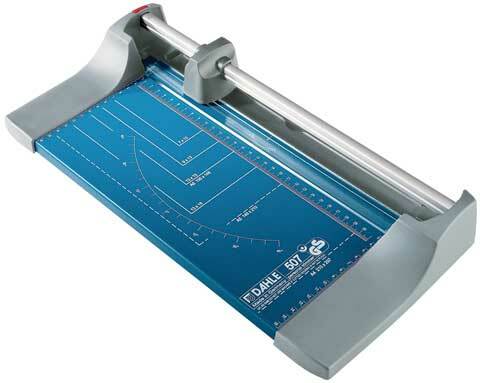 Light-weight, portable paper trimmers that are ideal for the darkroom, studio, home or office. The rotary action of these trimmers allow the blade to cut in either direction and sharpen itself as it cuts. It is this self-sharpening action that produces a clean burr-free cut and ensures many years of smooth precise cutting. Designed for safety and accuracy, the cutting blades are encased in a plastic housing that decreases the chance of personal injury. With a cutting capacity of up to seven sheets of paper at a time, these trimmers are perfect for cutting paper, card stock and photo paper. The sturdy work surface is printed with reference marks for proper alignment of material.